United States has two National Championships for amateurs a year. It’s been like this for as long as I can remember. 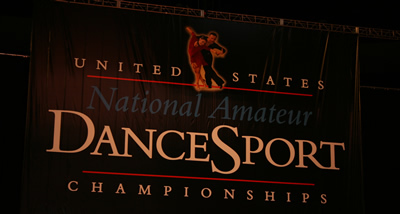 The NDCA-sanctioned National Championships is by far the better run of the two. Not to mention, it’s more fun to attend and more fun to dance. Simeon and I started going to the NDCA Nationals, also known as the Provo Championships (or sometimes just “Provo”), in the first year we started dancing together, back in the year 2000. We danced at Provo for eleven consecutive years, first as youth, then as adults. We were in the Finals for six out of the eleven times we danced, twice as youth and four times as adults. Our second time we made the youth final, we won it, in 2002, becoming the NDCA Youth National Champions in Standard, the style that was and still is our forte. We were NDCA Adult 10-Dance Champions twice (although, unfortunately, they didn’t and still don’t announce an award for that); we made the semi-final of the Adult Standard our first year dancing in the Adult category, where we languished for two more years before making and remaining in the final for the rest of our Adult amateur career. Provo has a special place in our hearts. Not the place, so much, but the competition. Because the competition is held on the BYU Campus, in their basketball stadium, no less, all of the amateurs must adhere to strict costume regulations. Some of these include length of the girl’s skirt in Latin, the use and placement of see-through materials, straps on girl’s shoulders having a required width of at least one inch, the depth of the man’s Latin shirt being no more than five inches below the jugular notch. In fact, the only reason why I even know what a jugular notch is is because of this comp. These regulations are annoyingly difficult to say the least. However, having danced the comp eleven times, I have a pretty good hold on the rules, what we can and can’t do, and where we can push the envelope. The costume enforcers know me by name. Some spectators, whose names I do not even know, greet me by name and ask how our dancing is going; I signed my first autograph in Provo. This year was our twelfth year attending Provo, and the first time we didn’t dance. Having retired from Amateur competition in August of 2010 in order to pursue our Professional careers, and in the process moving our country of representation to Bulgaria, Simeon’s home country, we are no longer allowed to compete in Provo. So we attended in support of the organizers, of the competition itself, and of our students. We had two couples competing, one in the Youth Syllabus Latin and Standard and the other in the Junior and Youth Pre-Champ and Championship Standard and Latin. It was a different experience watching the comp versus actually dancing in it. We bought floor tickets, for the first time in twelve years since we’d actually be using them; I didn’t have to worry about tanning or hair or makeup or whether my costume would pass the inspection. In a sense, I could relax and concentrate on my students’ dancing. And I’m glad I had the opportunity to do so, because our students did great! Our syllabus couple, Aaron Clark and Deanna Beglyarova, competed against over 90 couples in the Syllabus Standard and over 100 couples in the Syllabus Latin. This was their last competition together, due to their difference in height which will make it difficult for them to compete together at a high level. Regardless of their physical differences, they did wonderfully. In the Youth Syllabus Latin, in which – it will be remembered – they competed against over 100 couples, they made the final and were placed sixth. In Simeon’s and my most humble opinion, they should have been placed higher. We both agreed, objectively, that they should have finished fourth. We thought the results in the final were skewed. The first placed couple could not even dance their Rumba on straight knees! But that is the nature of competition. They were still happy to have made the final. In the Youth Syllabus Standard, in which they danced against over 90 couples, they finished an astounding third! And honestly, they could have easily placed second or first. Of the top three couples, there was no clear winner. You could have shaken their results in a jar and pulled them out at random and the results still would have been reasonable. But Aaron and Deanna danced their Standard with a postural ease and perfection that, in my opinion, made them stand out above the other two couples, although the other two certainly had their own positive qualities. Our second couple, Elijah Clayton and Hannah Shinsato, made a splash this year by dancing the Championship and Pre-Championships events for the first time. This couple has danced many times in Provo, always in the Syllabus categories. From the beginning of their careers at Provo, they have made the finals of their events. First as Junior competitors, they were two time Junior Syllabus National Champions in Standard and Latin, and last year they danced in the Youth Syllabus National Championships and took the titles for Standard and Latin there, as well. This year the competition was tougher. In the youth category, they danced the Pre-Champ Standard and Latin, taking second in the Latin and winning the Standard. In the junior category, where they danced the Championship Standard and Latin, they placed seventh in the Latin but were crowned the Junior Championship Standard Vice-Champions. These were great results from this promising couple, and they were very excited to have actually won one of their first Open level events. Simeon and I will be attending this competition probably for the rest of our dance careers, and we hope that someday we will be listed as one of the judges, as well. But for now, we must be happy with sitting on the floor and watching, reminiscing about our many years of competing here, and supporting the multitudes of younger couples as they work their ways up the ranks. Provo is a wonderful competition, the “Blackpool of the United States”, as Brian McDonald likes to call it; and we hope there will be many more generations of dancers who are given the chance to enjoy the energy at the NDCA National Championships, just like we did.